Our blogger friend Caroline from The Caro Diaries is an island gal from Trinidad and Tobago, but she’s currently going to school in Connecticut. She doesn’t get to head home and celebrate every holiday with her parents. Instead, she opts to take advantage of long weekends to explore new parts of the United States with friends. There are plenty of suggestions out there for what do do with a fresh cut bouquet, but some of them are nothing more than old wives' tales. Sending flowers to a grieving friend shows that you care and respect what he or she is going through. Follow these 3 tips to send flowers online to a friend in need. Check out these gorgeous designs! Meredith Wing has been creating whimsical portraits of fashionable ladies using real flowers in her multi media creations. 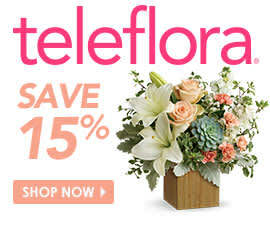 Look into taking advantage of Teleflora's great upgrades. Most of the time, going from a standard arrangement to a deluxe or even premium one only costs a little more, but your loved one will notice the differences instantly in all of our bouquets, centerpieces and floral arrangements. 3 (three) winners will receive (1) Gift Card for $75 at Teleflora.com + FREE Service Fee (approximate retail value $100) to purchase flowers from our Thanksgiving Centerpieces or Thanksgiving Flowers web pages. Sweepstakes begins on 11/10/15 and ends at midnight on 11/22/15.